Nobody makes pesto like I do. That's not boasting, it just means that I deviate from the usual pesto with nuts and cheese in favor of a simple version that plays up the ingredients I like best, basil and garlic. This idea isn't original. I adapted it from Angelo Pellegrini's "The Unprejudiced Palate," published by Macmillan in 1948 and reissued by Modern Library Food in 2005. Born in Tuscany, Pellegrini wrote exuberantly of the unpretentious dishes loved by Italian immigrants but largely unknown to most Americans. Years ago, I came across an autographed copy of the book, which Pellegrini had presented to "Jack Garland, who most perfectly reflects the spirit of our labors." Jack was John Jewett Garland, a Los Angeles socialite, philanthropist and political figure, who joined Pellegrini in "laboring" as wine judges at the Los Angeles County Fair in Pomona in August, 1951. Garland added a note to that effect under Pellegrini's autograph, so I have a doubly signed book, although Garland used only his initials. But on to pesto. Pellegrini's version is based on pasta al burro (pasta with butter). There's no recipe, only a description of the way he made it. I've kept the spirit of the dish, even to mincing the basil with a chef's knife, as Pellegrini did, but I've changed the proportions. The original was loaded with more butter than most people would eat these days. I've cut that down and replaced some of it with olive oil. And I've increased the basil substantially to make a prettier and more fragrant dish. Pellegrini adored pasta al pesto, and made it with basil that he grew in his garden in Seattle. "According to my taste," he wrote, " it is ---the best of all varieties of pasta asciutta [dry pasta]. When I eat it, I am never actually satiated. I simply stop eating when my jaws are fatigued and I can no longer masticate with ease." Serve it with a salad (Pellegrini suggested endive, escarole, dandelion or chicory shoots dressed with olive oil and wine vinegar). And, of course, a glass of wine, which to Pellegrini was "the indispensable accompaniment to good food." Wash the basil leaves and dry with a paper towel. Using a chef's knife, chop the leaves very fine. Cut each garlic clove into 4 or 5 pieces and place in a mortar. Add the salt. Pound until the garlic is mashed to a soft, moist paste. Add the chopped basil and pound until thoroughly blended into the paste. Spoon this mixture into a small bowl and set aside. There will be about 5 tablespoons. Cook the linguine in boiling salted water following package instructions until firm/tender, about 10 minutes. Drain. Place the pot over low heat and add the butter. When the butter is melted, add the basil mixture and blend. Then add the linguine and toss until evenly coated with the basil mixture. Serve at once. Makes 4 generous servings. Monahan Family Farm of Paso Robles bottles Mill Road Winegrape Juice, a blend of Cabernet Sauvignon and Syrah juice that is so luscious you might even prefer it to wine. 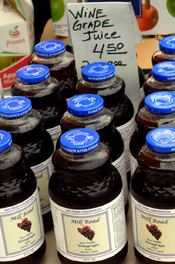 I came across the juice at the Saturday morning farmers' market in Templeton, but it's sold in Los Angeles too. The farm sends a shipment in time for weekend farmers' markets, including Echo Park, Santa Monica, Hollywood and Studio City. Prices start at $2.50 for a 12-ounce bottle. The juice also comes in a wine bottle, which is nice to put on the table for non-drinkers. Echo Park Farmers' Market, 3 to 7 p.m. Friday; parking lot 663 on Logan St., south of Sunset Blvd., Los Angeles. Santa Monica Pico Farmers' Market, 8 a.m. to 1 p.m. Saturday, Virginia Park (Pico Blvd. and Cloverdale). Hollywood Farmers' Market, 8 a.m. to 1 p.m Sunday, Ivar and Selma, Hollywood. Studio City Farmers' Market, 8 a.m. to 1 p.m. Sunday, Ventura Place and Ventura Blvd., Studio City. "Send that one around again," ordered the man at the end of the table. What he wanted was a bowl of kheer, a sumptuous Indian dessert of soft vermicelli floating in sweetened milk scented with rosewater, cardamom and saffron. This was the last course of a feast that honored visiting Indian cookbook author Julie Sahni. Dinner started with samosas and wine, then we sat down to a table laden with chicken korma, crab do-piaza (crab in an onion sauce), aloo mirch ( potatoes with green peppers) and rice pilaf, prepared by the hosts with recipes from Julie's book, "Classic Indian Cooking" (William Morrow). south Indian word for kheer, which is payasam. What made the dish exceptional was the intense flavor of the green cardamom pods that I had bought at Kothari's, a tea, spice and masala shop in Chennai.(Madras). And I had scattered plump, juicy raisins over the top, where they glittered like burnished jewels in a rich setting of chopped pistachios and sliced almonds. The recipe isn't mine. Vibha Bhojak of the Bharat Bazaar in Culver City gave it to me when I was shopping there. Kheer is commonly made with rice, but in this recipe I used Indian vermicelli cut in pieces ½- to ¾-inch long, You'll find similar vermicelli and green cardamom pods at most Indian markets. If you can find only long vermicelli, break it into short pieces. The raisins, moist and tender because they were so fresh, came from the Hollywood Farmers Market. I chose a blend of dark and golden varieties for a jewel-like effect appropriate to a festive Indian dinner. Combine the milk, sugar, rose water, cardamom pods and saffron in a heavy saucepan. Bring slowly to a boil. Add the vermicelli and cook, stirring constantly, until the strands swell and are visible, about 10 minutes. Remove from heat and let cool. Sprinkle with about 1½ teaspoons chopped pistachios and an equal amount of almonds, then scatter a few raisins around the nuts. Makes 8 servings. I managed to snag one remarkable recipe while I was in Paso Robles. 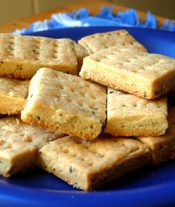 It's black pepper shortbread from Tom Fundaro, chef at Villa Creek. Fundaro served long shards of this shortbread on an appetizer plate that included blue and Camembert cheeses, pecans and dried fruits. It's more savory than sweet, slightly spicy with pepper, and buttery-tender. I've baked the dough in a tart pan with a removable bottom and cut it into wedges, but it's easier to roll it into a flat sheet, then divide this into small, appetizer-sized squares to pile on a plate alongside cheeses, nuts, grapes and raisins. Place the butter in a mixing bowl and let it stand until softened, then cut it into small pieces. Preheat the oven to 350 degrees. Add the sugar, salt, pepper and thyme to the butter, then add the flour. Using 2 knives, cut through the mixture as if making pie dough until the butter is evenly mixed and in very fine flakes. Add the cream a tablespoon at a time until the dough holds together and can be formed into a ball. Mix with a fork while adding the cream. When the dough begins to hold together, mix with your hands. You might need a little more cream, but the dough should not be moist and soggy. Form the dough into a flat round and place it on a sheet of baking parchment on a work surface. With a very lightly floured rolling pin, roll the dough evenly into an 11-inch square. Press with your hands to straighten the edges, but don't worry if the square isn't perfect. The edges will brown more deeply than the remainder of the square, and can be cut away later. With a sharp knife, cut the dough into six sections from top to bottom, then cut crosswise into 8 sections, forming 48 small squares. Prick each square two or three times with the tines of a fork. Do not separate the squares. Lift the parchment onto a baking sheet. Bake until lightly browned, about 30 minutes. Turn the baking sheet back to front halfway through the baking time. When done, remove from the oven. With a spatula, transfer the shortbreads to racks to cool. When thoroughly cool, store in an airtight container. Some outer squares may be deeply browned and slightly irregular in shape. Set these aside as treats for the cook. You'd expect food in a booming wine district such as Paso Robles to be laced with wine, and it is. I tasted everything from Cabernet-soaked Cheddar cheese at a farmers market in Templeton to beef smoked over broken up wine casks at a restaurant in San Miguel. Restaurant owners are sometimes winemakers too. At Villa Creek in downtown Paso Robles, I drank owner Cris Cherry's Mas de Maha, a blend of Tempranillo, Grenache and Mourvedre, and Avenger, which combines Syrah, Mourvedre and Grenache. These were big enough to stand up to a spicy poblano chile stuffed with quinoa and roasted vegetables, circled by fiery red chile sauce. Matthew Riley of Matthew's at the Airport puts Cabernet Sauvignon grapes on top of focaccia, marinates chicken breasts with Chardonnay leaves, lamb with Pinot Noir leaves and makes wine reductions that run the gamut from Merlot to Muscat Canelli. He also bottles his own wine, including the Sauvignon Blanc that I drank with pistachio-crusted halibut sautéed with lemon, white wine and butter. If anything could distract me from wine, it would be Matthew's sumptuous chocolate pave, sliced and arranged like a pyramid around vanilla pastry cream fluffed up with whipped cream and sprinkled with raspberries. For sheer fun, along with good food and wine, the place to go is the 10th Street Vineyard Café in San Miguel—if you're lucky enough to get a reservation. The café opens for dinner Friday through Sunday, and there's just one seating. Owner/chef Dallas Holt chats with the guests and sends around a bota bag of sangria that brings on a lot of laughter as each person attempts to drink without spilling. The food is Basque, served family style in almost too many courses to count. The night I was there, each course was glorious, from fish cakes with tarragon-butter sauce to Spanish style bouillabaisse. The standout was a beef roast smoked for seven hours over wine cask wood and served with Merlot sauce. Sliced thin, it was as tender and succulent as beef could possibly be. Diners can bring their own wines, and there's no corkage charge as long as one orders bottles from the restaurant list too. My friends and I drank Clautiere Vineyard Estate Syrah 2003 along with Black Hand Cellars 2004 Pinot Noir from a boutique winery with a vineyard west of San Miguel. I wish I had recipes for Holt's Basque butter, a garbanzo bean puree lightly sweetened with honey; or the baked pasta with meatballs, sausage and assorted meats, or migas Manchegas, a main dish of bread crumbs, garlic, chorizo and bacon, topped with apple salsa. Villa Creek, 1144 Pine Street, Paso Robles. Tel: (805) 238-3000. Matthews at the Airport, 4900 Wing Way, Paso Robles (located inside the main terminal of the Paso Robles Airport). Tel: (805) 237-2007. 10th Street Vineyard Café, 249 10th Street, San Miguel. Tel: (805) 467-3141. "To drink only the superlative is a powerful regimen, tending to jade the palate, as if one were to read only Milton." --Idwal Jones in "Vines in the Sun: A Journey through the California Vineyards," William Morrow, 1949. That weird, foreshortened, dumpy image in the fun house mirror turns out to be me. In the next panel, I appear enormously long, topped with a tiny ball of a head, but in the final mirror, I am gorgeously slim, like a pencil, so I linger there to admire that impossibly alluring image. This fun house isn't in an amusement park. It stands in a thicket of plants outside the tasting room of Clautiere Vineyard in Paso Robles, Calif., on the Central Coast. The tasting room is just as much fun. It's stocked with outlandish wigs for visitors to don so that sampling wine at Clautiere is like dolling up for a costume party. This doesn't mean that the wines aren't serious. It's just that some Paso Robles winemakers favor a fresh, breezy approach that makes wine anything but intimidating. Boo Boy Red from the Midlife Crisis Winery guarantees a giggle. Four Vines Winery hands out "Biker" tattoos to advertise its Biker Zinfandel. I don't know whether to cry or laugh at Harrys Sweet Tears Verdelho from Fralich Vineyard. And I can't even pronounce the Irish names on Mat Garretson's labels. But who cares, when the wines inside are so good. Paso Robles has boomed from a handful of vineyards to 170 bonded wineries spread over an AVA (American Viticultural Area) that encompasses 1,000 square miles. And it's still growing. For more information, click here to visit the Paso Robles Wine Country Alliance. There's talk of breaking this huge area up into nine or 10 appellations. This makes sense, because there's enough variety in soils, rainfall and microclimates to make your head spin. Rainfall ranges from 8 inches annually in the eastern part of the region to 45 inches in the west. Some of that fell, hampering the grape harvest, when I was there. An electrical storm at night was so fierce that I dreamed a mechanical harvester was crashing through my lodgings. In a single day, night and day temperatures can vary by 50 degrees. At the low end, it's really cold. In October, I shivered under two quilts even though wrapped in a thick terry robe. The region is so vast that in a week I could reach only a handful of wineries. Some were in rolling, oak-studded terrain far to the west, others along back roads toward the east, and a few along Highway 46, the main drag of the region. If you're in town without a car, you can at least get to Anglim Winery's tasting room by the railroad tracks. Paso Robles is known for Rhone wines and Rhone blends, but as much Cabernet Sauvignon is planted in the region as in all of the Napa Valley. Cabernet, Syrah and Merlot make up two-thirds of the vines planted, but Zinfandel is so important there's an annual Zinfandel festival in March. Super serious wineries include Windward, which makes Pinot Noir as if in Burgundy. Stephan Asseo of L'Aventure was born in Paris, started his wine career in Bordeaux and now specializes in Rhone varietals and Rhone-Bordeaux blends. Tablas Creek is a joint venture between Chateau Beaucastel of Chateauneuf-du-Pape in the Rhone Valley and American importer Robert Hass. Its Rhone wine vines came from French clones, and the winery propagates Rhone cuttings for other winemakers. If you visit the tasting room, you might find a few for sale. Tablas Creek Marsanne and Grenache Blanc vines now grow along a fence in my yard. Tasting room fees range from $3 to sample six wines at Peachy Canyon to $15 if you want to taste certain reserve wines at Anglim. General tasting at Anglim is free, and region pioneer Gary Eberle has always believed in free samples. Tasting rooms range from Peachy Canyon's quaint 100-year-old schoolhouse to Robert Hall's grand structure with imposing caves and a central waterway that made me think of Mogul palaces in northern India. The wines can be hard to get. Small producers tend to sell only at their tasting rooms or through web sites, which is a good reason to go to Paso. Not only can you find pleasing wines, but the region still has the countrylike, pioneer enthusiasm that is just a memory in that high-flying wine district to the south, Santa Barbara County. Drawing up "top 10" lists is futile. The minute you say something is the best, something else turns up that is just as good or better. Therefore, this list of 10 Paso Robles wines is a sample of what the region has to offer rather than a winnowing out of the best. But as indicators of the area's capabilities, they're all great choices. Delightlful grapefruit flavor rather than grassy or herbaceous. I can't start the day without half a grapefruit. Now I can end it with a grapefruit-tasting wine. 2. Clautiere Vineyard 2005 Estate Viognier, $23. An elegant, refined wine, pale and gleaming in the late afternoon sun as I sipped a glass with winemaker Terry Brady. Mat Garretson blends Viognier and Roussanne from younger vineyards into an everyday wine with good fruit, approachable but with some structure and complexity. The mix is 50.4% Viognier and 49.6 % Roussanne. This dry, crisp white wine blends 46% Grenache Blanc, 45% Roussanne and 9 % Viognier. I can find Robert Hall wines in Los Angeles, but not this one. It's only available through the tasting room. 5. Edward Sellers Vineyards & Wines 2005 Blanc du Rhone White Rhine Blend, $32. Honeyed and lovely to drink, this wine blends 45 % Roussanne, 45% Marsanne and 15% Viognier. 6. Eberle Winery 2003 , Steinbeck Vineyard Syrah, $23. I picked up rich berry and herbal flavors reminiscent of a good Oaxacan black mole—has anyone compared a wine to mole before? It was such a hit at a dinner party, that all my guests wrote down the name. 8. J. Lohr Vineyards & Wines 2003 Cuvee St. E Red Bordeaux Blend, $50. This blend of 85 % Cabernet Franc, 10 % Merlot and 5 % Cabernet Sauvignon could last 10 to 15 years, according to Steve Lohr, but I like it right now. 9. Treana Westside Red 2003, $18. A good backyard barbecue wine, soft, and light. The blend is 43 % Syrah, 42 % Mourvedre and 15 % Grenache. 10. Maloy O'Neill Vineyards & Winery 2004 Malbec, $25. Malbec is the signature wine of Argentina, so common that professional wine tasters down there find it a bit tiresome. This Paso version acquires an interesting edge by blending in 10 % Cabernet Sauvignon and 5 % Merlot. The rest is pure Malbec. Appetizers annoy me—unless someone else makes them. I put so much effort into planning a dinner party that adding one extra dish is enough to make me want to uninvite everybody. That is, until I came across a roasted pepper appetizer that my friend, Diana Arias of Mount Washington, brought to someone else's dinner party. It's a gorgeous arrangement of brightly colored bell peppers mixed with poblano chiles, which add their own distinctive flavor and a touch of heat. 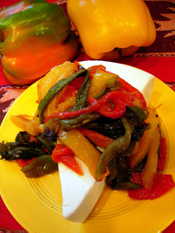 Diana serves the peppers with crackers and soft, fresh Mexican cheese. You could also put them on an open-face grilled cheese sandwich, add them to an antipasto platter or even mix them into potato salad. The best part is, the peppers can be prepared in advance, and the procedure is so easy that even I can't find any excuse not to make this appetizer. There should be about 2 pounds peppers, including the poblanos, and you can use any combination of colors you like, such as orange or yellow peppers along with red and green. . Preheat the oven to 375 degrees. Wash the peppers and poblanos, then quarter each lengthwise, removing the stem ends and washing out the seeds. Lightly oil a large baking sheet with olive oil. Place the pepper and poblano quarters in a single layer on the baking sheet, cut side down. Press to flatten slightly. Bake 15 to 18 minutes or until lightly browned. Remove the baking sheet to a rack, cover the peppers loosely with foil and let stand until cool enough to handle. Remove as much peel as possible, and cut off any crisp, browned portions. Slice the peppers lengthwise into strips about 1/3 inch wide. Place the strips in a serving bowl or, if making in advance, in a container with a tight lid. Sprinkle with the olive oil, balsamic vinegar and salt to taste, then toss with a fork to combine. Let stand 30 minutes or longer before serving. To eat, place some of the cheese on a cracker and top with the peppers. Makes 3 cups marinated peppers. A wine that sparkles like stars makes a beautiful start to a party. More special than Champagne because it is so rare, Mosby Winery's Stelline di Cortese (little stars of Cortese) is made from a scarce Italian white wine varietal. Just six acres of Cortese are planted in California, four of them at Mosby Winery and Vineyards in Buellton, the other two at Mount Palomar winery in Temecula. Bill Mosby came up with the idea of turning Cortese into a sparkling wine, and it's a charmer, citrusy, bright and refreshing. The 2004 Stelline di Cortese ($16) is available only at the winery, which will ship. Mosby also makes a still Cortese ($16) and La Donna white table wine ($14), which blends Cortese with Chardonnay. The winery is located at 9496 Santa Rosa Road, Buellton. Tel: (805) 688-2415 or go to www.mosbywines.com.